Kubota Genuine Oil & Filters | Northern Power Products Inc.
Genuine Kubota oil is specifically designed for Kubota industrial engines to maximize the life of your engine. It lubricates, cools and cleans—all at once—to protect performance and extend the life of your engine. a engine oil minimizes high-temperature degradation and maintains the proper viscosity. Kubota engine oil cleans the soot from your engine and absorbs particles for fine dispersion. 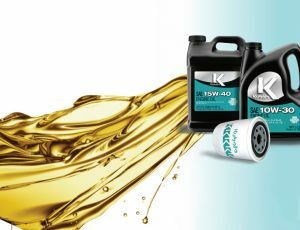 Kubota engine oil is blended with specific additives that substantially reduce engine wear. interval recommended by the manufacturer. Kubota industrial engines encounter some of the harshest operating conditions on the planet. Don’t trust your performance to some second-rate filter, designed only to be good enough. Only genuine Kubota filters are designed to remove harmful contaminants encountered in the tough applications where Kubota engines perform each day – where high temperatures, dust and other hazards are just part of the job. Watch to find out why it's important to use Kubota Genuine Filters to service your Kubota engine. 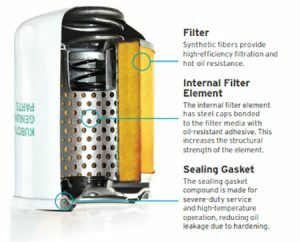 Why are Kubota filters better? 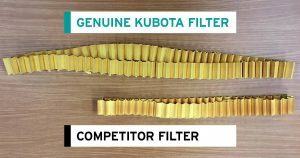 Tests show that over time, the filtration efficiency rate of a genuine Kubota filter is better than that of an after-market competitor. The efficiency of Kubota filters actually improves as the hours pass. Not so for the competition.